I'm a Biomedical Engineer Ph.D, Eagle Scout, who loves to travel, camp and learn. I've been to almost all of the 50 states and 30 different countries. ***I start off by saying that the staff I did interact with were all very nice and it have a great mountaineering school with excellent staff and a nice camp store. Also, this campground is definitely in a great location within the valley. However, for the cost you'd think they could do a lot more maintenance to these "tents". Similarly, not sure why they aren't all heated as they include a simple cheap heater that they could easily put in all of them. When the campground is making about ~70K per night on the weekend you'd think they could easily afford to maintain the grounds. The tents are filthy, the bathrooms have graffiti in the stalls and there's no area for picnicking, fires, seating, etc. (things that you always get included at a standard campsite). My personal tent is way cleaner than these "tents" as it appears that they haven't cleaned out the dirt in quite some time…They simply (hopefully) just come in and change the sheets in between people and that seems to be about it. Also, I can understand not having people cook/eat in their tents, but they should then provide a picnic area so you don't have to bus/drive to a different area of the park or eat all your meals in the restaurant (Another way they're making money) if you'd like to bring in some of your own food or sit around a fire and have a S'more. They do have a lounge with a fire place, so why can't they have an outdoor fire pit so you can actually be closer to nature? Stayed October 11-14th 2018 like another reviewer and couldn't believe how disrespectful so many of the other "campers" were during the quiet hours. People (not just the kids) were not only running through and disrespecting people personal space/belonging but they were up and extremely loud late into the night (at least 3am). Although isn't part of the reason to come to this incredible National park to get up early and explore the park? May people seemed to treat this "campground" as a party spot. People in true campgrounds are much more respectful of the others around them. While, I'll definitely be back to Yosemite, I won't be staying here again. We got a last minute cancelled site at the Fallen Leaf Campground, and thought we’d truly lucked out. We stayed at site 87 which is nestled among towering native pine trees on the South end of the campground and one of the few sites which doesn’t have neighbors on all sides. The sites have the standard standing BBQ's and fire rings at all sites (but we couldn’t utilize them because of the fire ban), old picnic tables and various amounts of space for RV’s/cars and the tried and true bear box. In this campground you NEED to utilize the bear boxes. They have signs everywhere about the mass amount of bear activity and how there is a mother and her 2 cubs which have been terrorizing the campground for some time this season (2018). Again, you need to keep everything (food, toiletries, etc.) in the bear box at all times. The sites are reservable, and on top of the $35 (nonelectric) per site there is a $7 fee for a second vehicle, Yurts go for $86 which do have power and a nonrefundable $10 service fee…. While the campground allows dogs, they aren’t allowed in the Yurts. There’s lots of bear proof dumpsters around the campground, lots of potable water in strategic spots and a number of decent restrooms, and it was nice that at some of them they provided hot (pay) showers (at $1 per 3 minutes) and while the ADA has some control the standard one has no control over the heat or pressure its simply on or off. Also, the restrooms have no soap, paper towels, or hand dryers, etc. Which was a little disappointing for the cost. My biggest disappointment in the setup of the campground has to do with the bears and cleaning your dishes. There is no dish-washing area in the entire ~200 site, ~14 bathroom campground. They specifically ask that you don’t wash your dishes in the sinks or at the water spigots as they don’t want any food particles going down the drains. So, when I asked about disposing of the dish water they said to just toss it at the base of a tree, as it’s dry and the trees would appreciate it. This doesn’t help keep the bears away… While we scrapped and collected every bit of food waste we could and tossed it into the dumpsters, ff you’re just tossing food scrap-soaked water at the base of the trees the bears are going to come for the smell… I’ve stayed at other sites in bear country which have setups for disposing of the waste water and food scraps to detract bears and Fallen Leaf definitely is lacking and this is possibly part of the reason they’re having such an issue with bears. While, our site (87) would probably normally be a great location with the Fallen Leaf Lake being the only thing behind you and no neighbors on at least 2 of your sides, we happened to somehow book the same weekend that a corporate event was taking over the vast majority of the campground with almost 200 people…. While, not entirely the campgrounds fault it was a little disruptive to have this mass number of people come directly next to us in site 88 for their meals as they’d decided to make that site the meal prep site for breakfast (they started prep at 5:30 am) and dinner (we actually had to ask the drunk group to stop screaming at midnight) these were both well outside the “quiet hours” and definitely surpassed the “6 people per site” rule. Otherwise this campground is in a great location to see the area as it’s only approximately one-quarter mile north of Fallen Leaf Lake. The trail from the campground was only 3 sites over from us. The Taylor Creek Visitor Center is directly across Highway 89 and is a great location to talk to the Rangers about other potential hikes in the area. They also have interpretive programs, guided walks on the Rainbow Trail and to the Stream Profile Chamber (which was closed because someone decided to break it. Although it should be repaired now… end of September 2018). Also, nearby Baldwin Beaches or Pope Beach, which cost $10, or you can go to the Tallac Historic Site with tours and events at its historic buildings and grounds and the free (dog friendly) Kiva beach which is exactly the same as the other pay access beaches…. There’s also a really nice paved bike trail that runs 3 miles along Highway 89 and can be used to access all of the above. You have access to excellent day hiking and backpacking in Desolation Wilderness via the Glen Alpine or Mt. Tallac trailheads which are also nearby. 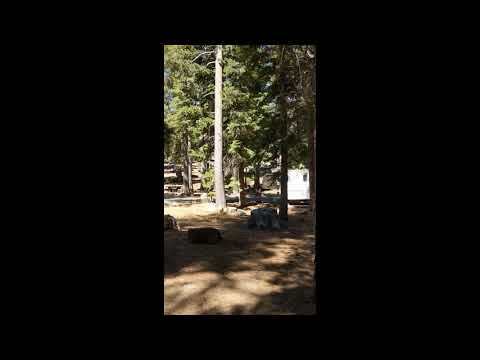 I walked through the seasonally closed Eagle Point Campground while exploring the Emerald Bay section of Lake Tahoe. This campground is a newly renovated area of the peninsula on the South/West side of the Emerald Bay State Park separated into Upper and Lower sections. Since the campground was closed we had to park on Highway 89 and walk through the campground to get to the Rubicon Trailhead which is located at the divider between the 2 camping sections. Also, it should be pointed out that there were signs everywhere about using your bear boxes and that they’d fine you if you leave anything in your car. I know some people seem to have an issue with this for some reason…but I don’t want a bear roaming through any campground I’m staying at. There weren’t any sites that I saw which could hold an RV or 5th wheel, unless you have something under 18 feet… So maybe tents only, and there are no hookups. While I know I got a sterile experience since no one was actually camping, the campground was very clean and well maintained and the restrooms looked really nice. They had running water, flush toilets and pay showers ($1 per 3 minutes). The little amphitheater at the trailhead was cool and seemed ideally setup for presentations with incredible views of Lake Tahoe. The 13 sites of the first-come first-serve Bayview Campground are part of the well maintained US Forest Service property located in a prime area literally right across the street from the Inspiration Point Overlook of Emerald Bay State Park and is central to several awesome hiking trails in the South Tahoe area. Two of the hiking trails which lead into the incredible (and uncharacteristically names) Desolation Wilderness to Granite Lake and Cascade Falls start literally behind this campsite. Because of these trails and the crowded Vista across the street there are hordes of people coming in an out throughout the day looking for parking, especially during the weekend. Thus, do not expect a quiet/secluded campsite during the day, it does appear to become quieter after 6 pm as less people are walking/hiking around and staring at you while you camp. The campsites have a decent amount of room between them and are nestled within a grove of beautiful trees, giving you plenty of shade during the day and a great place to put up your hammock. The sites also have all of the basic camping stuff like a fire pit, picnic table, and bear locker provided. Note that these sites are really tent only (No RV will fit in here, maybe a small 5th wheel) and parking spaces are pretty small and can probably only fit one car (or 2 tiny ones) in most spots, about 20 feet total length. However, there is no running water, so make sure to prepare for your camping and any that you might need if you hike out into the wilderness and the weather conditions because when it’s dry you can’t have a fire and there won’t even be any water flowing in the stream that runs through the campground to even get some water to filter/boil. The fee is $18/night - 6/people (1 car, $7 for a second) and 2 pets are allowed. Great place to stay if you are looking for a convenient location right off Highway 89 and central to a ton of prime South/East Tahoe hiking trails, but lacking in amenities and extremely busy with day trippers. I find it a little disappointing just how close the campsites are to each other here, meaning you’re not going to get anything close to a secluded camping experience. The facilities were dirty/sandy (although you are right on the beach), probably because not only are they being overused by day trippers to the beach and the many campers. Although, they do have coin-operated hot showers available (2 minutes per quarter). They really do pack in the 50+ sites here although there are 3 walk-in sites with great views over the beach and of the ocean, which are separated from the RV (up to 40’) mad house, but then you’re right by all of the day use people and even more out in the open as there is literally no coverage at all. The RV sites have electric hook-ups and there are shared water spigots (not hook-ups). Dogs are allowed at the campsite on leash, but not on the beaches here at all (Although horses are… Guess only one animal per “beach”). If you want a dog friendly beach go just a little south to Poplar Beach where the doggos can roam free off leash and have a blast. The State Beach Park itself is very tiny. $10 to park, there’s a small visitor centers, beautiful beaches, nice scenery, not a lot of vegetation. From here you have access to the 4-ish mile long Half Moon Bay coastal walking/bike trail which runs right through the back of the campground and into the “park”, and of course there are ~4 miles of sandy beaches to enjoy. Should you need connectivity there is actually (unsecured) wi-fi provided by the park and adequate cell coverage!! Overall, remember that while you have great access to the beach and the campground is pet friendly you’re definitely, not exactly going to get a remote camping experience and the dog beach is a little way away. The facilities are a bit dirty and jam packed and could be a little better maintained. As a Ranger for The Dyrt I sometimes get the opportunity to test out products and what I got to use during this trip as a day pack during this trip was Ethnotek’s Setia 20 Liter backpack. While listed as a laptop backpack I used it to store my snack, water bladder/bottle and other first aid type items. I used the laptop pouch to hold the water bladder and ran my tube out the side. Worked perfectly!! For being a compact backpack, I really liked that it has both padded shoulder straps with a slide adjusting sternum strap and the raised lower back padding which made for a comfy fit and allowed a bit of airflow. I also like that it’s water resistant and contains a hidden built-in rainfly, not that it has rained once since I’ve moved out to Northern California, but it is foggy and a bit damp first thing in the morning. The top zippered pocket in the top hood is the perfect size for items which you’ll want to have easy quick access to like; IDs, credit cards, extra sunscreen, etc. The main pocket is easily accessible via either the drawstring at the top or the side zipper so you can grab things out of the bottom without having to root around through everything in the pack. I do appreciate the laptop compartment, but for a more urban commuter bag I think this would be better utilized with additional pockets to separate out your work items and as a day-pack I think the laptop sleeve would be better utilized as a water bladder holder if there was a slot to pull the tube through. The only real drawback I had with this gear was that the side zipper doesn’t have a lock of sort for security. I like that there are the 2 zippers, but I think that having some sort of webbing across the zipper so that you could place them both on that side making it a little more difficult for someone walking behind/beside you to just unzip the side and pull out items. This added security isn’t really needed if you’re out hiking, but if you’re commuting in a large city or on crowded public transportation could really save you from losing some valuables. Overall, I give the bag 4/5 stars. I really love the company’s mission of keeping culture alive by creating high quality laptop and travel bags that feature ethically sourced handmade textiles. The back is extremely comfortable and has a ton of great features, but I think there are just a few minor tweaks which would make it truly unsurpassable. · Built-in handmade textile paneling. Exterior & interior. I found out that 2 of the 4 sites, that can accommodate 30 people each, are open to the public, reservations are handled through the emailing the PDF reservation form to camp@presidiotrust.gov. The staff person indicated yesterday that weekends are booked solid through the end of the year; however, weekday sites are available. This is a great place for a group camping event. With the campsites centered around a large communal campfire circle. Really seemed like the whole campground is very well organized and clean, with each of the 4 sites also having individual fire rings, looked like nice clean bathrooms, and plenty of space for people to run around. There's a great view of the ocean nearby as this is basically directly above Baker Beach. Since it's in the Presidio, come prepared for fog and cold weather. With a nice big fire and plenty of warm clothes, it seems like it could provide a very cool experience to watch the fog blow in through the trees. Note we haven’t camped here because of the crazy high campground cost being $125 per site, thus I’d say that Rob Hill is definitely intended for groups, not for individuals. The campsite’s main distinction is the site for the Camping at the Presidio (CAP) program, which provides youth with meaningful outdoor experiences. When the U.S. Army left the Presidio, Rob Hill was a dusty, rustic site. It was expanded and improved in 2010 with support from the Evelyn and Walter Haas, Jr. Fund. "Rob Hill Campground is a place where children and families have the opportunity to pitch a tent in their national park, enjoy s’mores cooked over a campfire, and wake up in the woods to the sounds of nature,” said Walter J. Haas, Chair of the Evelyn and Walter Haas, Jr. Fund and son of its founders. To request a site, please right click on the above link and Save Link, complete it, and email it to camp@presidiotrust.gov. (Mac Users: print the form, fill it out, scan it, and send it to camp@presidiotrust.gov.) Some browsers are unable to open this form properly, so please make sure it is saved to your computer. Reservations are filled on a first-come, first-served basis and are confirmed via email. For questions, please call the Presidio Visitor Center at (415) 561-4323. Reservations cannot be made over the phone. RV, pop-up and camper-truck camping is not allowed in the Presidio. No hook-ups available. Reservations begin at 12 pm and end at 11 am the following day. Service dogs are the only pets allowed. Alcohol, smoking, firearms, explosives, and generators are not permitted. Campsite permits come with four parking passes. Please park in the designated parking area; illegally parked vehicles are subject to ticketing and towing by the U.S. Park Police. Additional paid parking is close by for additional vehicles. All sites are walk-in. ADA access to the sites is available. Vehicles are not permitted in the campground proper. Each campsite is equipped with a fire pit (you must bring your own firewood) and a fixed charcoal barbecue grill. Please do not burn wood or charcoal when there is a Spare the Air alert in effect. Visit http://www.sparetheair.org to learn more. Quiet time is 10 pm to 6 am. The campground cannot be considered a temporary residence. Heavy rains and high wind advisory cancels. Please call the weather hotline (415) 561-2115 for updated information. The Great Room and Fire Circle are reserved for education programs only. Please do not disturb the groups using these spaces. Two of Rob Hill's four group sites are reserved for the Camping at the Presidio (CAP) program, which provides youth with meaningful camping experiences. Through this 'train the trainer' program, the leaders of schools and community organizations are given the skills to bring groups of kids to explore the Presidio's outdoors. These adventures offer hands-on learning and exploration. CAP leaders love "getting to know the kids in a different setting" and seeing their kids' enthusiasm about simple natural wonders like a banana slug or the night sky. "The whole experience was truly magical!" said one CAP participant. CAP is a partnership of the Presidio Trust and Golden Gate National Parks Conservancy. Overall, I gave the campground 4/5 stars because it was very well maintained and in a great location. But the cost is pretty exorbitant and there are only 2 sites open to the public. The campground is about 10 kilometer (6.3 miles) hike from the Bear Valley Visitor Center or an 8.8 kilometer (5.5 miles) hike on the Coast Trail from Palomarin. Note: Reservation/Confirmation Notice ≠ Permit. So even though you may have already made a reservation online, you must stop by the Bear Valley Visitor Center on your arrival date to pick up your camping permit and parking pass. So, if you want to drive back to the Palomarin trailhead for the “shorter” hike this could make your overall trip a bit longer as it can be almost a 40-minute drive. Also, you could bike to the campground, but the only bicycling route is via a strenuous 10.7 kilometer (6.7 miles) ride along the Stewart Trail from the Five Brooks Trailhead. The campground consists of five individual sites and three group sites; three of the individual sites only hold up to four people. Vaulted toilets, and potable water! Campsites have charcoal grills, picnic tables, bear boxes/food storage lockers, and some sites have a little privacy due to the high grass. Because the campground is in the middle of a grass field, campfires are only allowed on the beach (You need to get a permit from the Visitor Center). That’s really a good thing as whom wants to wake up in the middle of a field on fire. Also, you might want to be on the lookout for small vermin running around the fields and looking to snag any food you’ve left out. We didn’t have any issues, but definitely heard them. Thus, from our exploring the campground I’d recommend campsites 6 &/or 7 as they provide a little more seclusion. Also, as I went in late July the majority of the campground seemed a little drab. Mostly brown dried out and dead glass, from what I understand this is typical of summer in this part of CA. I’d maybe try coming in spring (May) as the wildflowers in the area are amazing!! Saw them off the Tomales Point Trail, which I highly recommend. While the campgrounds themselves are nice, and I appreciate not having to lug in all of our water and the use of the vault toilets I personally think that the amount of day hikers, and horse back riders detracts from the feel of this being a back-country campground. Maybe in the Fall/Winter or Spring it’s better. Gear/Product Review: As a Ranger for TheDyrt.com from time to time I get to review different products and during this trip I got to reward myself for the hike into the campground with Mountain House’s new 2-Serving Homestyle Turkey Dinner Casserole. I’ll admit that after reading the description I was a little skeptical at first, however, I think the best way of describing this meal is that it tastes like Thanksgiving!! I really enjoyed the combination of turkey, stuffing, vegetable and spices. They really did add up to what I think a true Thanksgiving day meal tastes like. While like any dehydrated meal you have to be good at mixing it, this one is no exception. If you don’t mix it up properly (they suggest at least twice in the directions) you could definitely find yourself with a ball of spice or a piece of stuffing that isn’t fully rehydrated, but that’s easily fixed by mixing it up some more. The large chucks of turkey and what ends up looking like real stuffing was a very pleasant surprise to this meal. It was well deserved after an 8+ mile hike. The amount of carbs and protein are perfect for that post hike meal. Especially if you eat both servings like I did! Although, I think that a normal couple could easily share the meal. As my final thought, I would definitely recommend that anyone looking for a meal that tastes home cooked with little effort, you take this one along with you on your next backpacking trip. As it weights less than 4 oz, you’ll be able to bring quite a few! I give the Mountain HouseHomestyle Turkey Dinner Casserole 4.75/5 Stars! Great location just outside the city on a Volcano!!! San Francisco East Bay residents actually have a volcano in their backyard at Sibley Volcanic Regional Preserve. Originally called Round Top Park, Sibley shares with Temescal and Tilden Parks the distinction of being one of the East Bay Regional Park District's original parks. The Sibley backpack camp is a small, primitive hike-in site for a maximum of 15 campers (although this would be super cramped in my opinion, unless it a bunch of small kids), a moderate 0.2 mile walk from the parking lot (NO VEHICLE ACCESS). The site has basically 360 degree views of Mount Diablo, Vollmer Peak and Tilden Park. There are only two tent pads - approximately 10'x25' and 10'x20'. Site has 2 picnic tables, 1 serving table, and a pit toilet close by which was very clean and well maintained. No wood fires or BBQs are allowed; only camp stoves are allowed for cooking, your night time enjoyment. Drinking water is 0.2 miles from camp at the trail head so keep that in mind before it gets too dark to hike back and forth for a drink. There are several trails providing tons of access throughout the preserve. The 31-mile East Bay Skyline National Recreation Trail, part of the Bay Area Ridge Trail system, traverses the preserve along the ridgeline between Wildcat Canyon and Anthony Chabot Parks. Round Top Road goes from the Sibley visitor center to the top of Round Top. Round Top Loop Trail circles Round Top peak. Volcanic Trail, once a quarry haul road, contains most of the stops on the self-guided volcanic tour. Dogs are allowed throughout this section of the park and in camp on leash but are not allowed on the adjacent Huckleberry trails. Also, the EBRPD lists, dogs “must be under owner's control at all times” and must not disturb other animals or park visitors, but I definitely saw a lot of loose well behaved dogs running free. Bikes are allowed on the fire trail, but there are lots of hikers and dog walkers in this park so be mindful. Also, Horses are allowed but there is no hitching rail and no water troughs in the park (or at least that I saw anywhere). If you decide to try and bike be mindful that most trails are hiking and equestrian only. A few trails are multi-use. Bicycles are not allowed on narrow-gauge trails, except on the Skyline Trail between the Sibley visitor center and Old Tunnel Road. Bicycles are allowed on the wider-gauge fire trails and paved roads but are not allowed on Sibley Round Top from EBMUD water tank road junction to top of Round Top Peak. Vehicles must be parked in the staging area and display a valid overnight parking permit: 3 parking permits are included in the reservation and will be mailed 5 days in advance. No additional parking permits are available. Otherwise, you can actually get here via public transport by Taking the AC Transit CB bus to the Mountain Blvd stop, them walk about 3 miles to the park. While you can check if it’s already reserved online. Reservation must be completed at least 5 days in advance by calling 1-888-EBPARKS or 1-888-327-2757, press option 2. You’re situated right off to the side of some immediate access to 16 miles of partially wooded roads (“trails”) marked for multiuse, Biking, Hiking, or Horseback riding. These “trails” at the Alston Tract of the Upper Hillsborough Preserve meander through pine flatwoods, consisting of both slash and longleaf pine overstory and floodplain swamp along the river. On the eastern edge of Zephyrhills, the nearly ten thousand acres of the Upper Hillsborough Preserve protect the Hillsborough River as it drains out of the Green Swamp towards its destination in Tampa Bay. This preserve is divided into the Upper Hillsborough Tract and the Alston Tract. The Alston Tract is a gorgeous portion of the Upper Hillsborough tract. Protecting the upper reaches of the Hillsborough River, the river’s floodplain provides natural storage of floodwaters and acts as a filtration system for runoff. The property also serves as an important link in protecting wildlife habitat in the Hillsborough River greenway corridor. Thus, there is an abundant amount of wildlife and many nice views. The property’s roads and trails meander through pine flatwoods, consisting of both slash and longleaf pine overstory, palmetto/gallberry understory and hydric hammock and floodplain swamp along the river. An interesting note is that on a short hike, one can travel through three different counties. Depending on where you go you can be in the sun for most of the hike. Parts of these trails can be filled with water (large puddles). These “walkie talkie” and their headsets are wonderful. I got over 8 hours of use on a full charge, and they seemed to charge pretty fast on the desk charger. Once you figure out how to set the radios to VOX then using either the built-in mike or the supplied headset for hands free talking is nice and easy. The snug fitting earpiece is decent, if you can get it properly placed in your ear. It takes a little bit of wiggling to get right, and that's the only thing I'm not absolutely thrilled about regarding these walkies. Of course, it would be easy to just get a different ear piece, as these support standard earpiece inputs. Could be just me, but from what I experienced, I initially just got a little confusing on the menu when I first started playing around with them. Once you get used to them, they are fine. Remember, a full-featured radio must have some complications. My main (minor) complaint is that you have to use the charging base with the proprietary adapter plugs, either the wall or car. It would be nice if you could charge the radios directly with a micro USB so there is one less charger to pack. The transmit audio was robust and loud, in my video I barely have the volume turned up at all. Whisper mode was interesting, as it really amplified quiet "whispered"…. Overall during several of my different tests audio reproduction was good and accurate, and they didn't clip anyone's speech. Use of whisper mode with a headset dramatically improved reception, as it increased microphone sensitivity as well as gain. When I tested in on the water with my friend the receive volume was good, except in the noisier areas (as we’re going full bore out to our fishing location), like one would expect. However, with the headset, this problem is eliminated. The radios are durable and well built. Not surprising, since Midland has some great commercial equipment. Battery life is good as well. Easy to use and carry. Weather radio is a plus, very easy to set up. I liked all the features, including the "lock" on the buttons. Overall you will really enjoy using these radios because they are light weight, easy to use, have incredible features and have great reception compared to any other brand I’ve used. I give the Midland – GXT1000VP4 TWO-WAY GMRS RADIO 4.25/5 Stars! Payment is on the honor system, bring cash or check because that actually saves you money versus the tax and fees for using the online reservation portal. The gates are locked at night, but the camp host can give you a pass code. There is 1 bathhouse at Cypress Glen. The toilet facilities in the loop were clean, but could have used a good once over. They seemed to have been maintained, just not super regularly and thankfully no guests had come in and destroyed them. This time there was no hand soap, hand dryers, or paper towels available and it looks like they permanently removed the paper towel holder that used to be there during my last stay. Access to boat ramp and hiking trails including the Withlacoochee State Trail. Access to the lake for fishing, canoeing/kayaking from campground. This is a great place to camp and lots of fun trails and exploring! River is easy to access and there are lots of areas to hang and picnic! A rails to trails walking/bike path runs nearby. The biggest drawback is that it's located almost underneath I-75, so you do hear highway sounds all the time. It's not bad, but while it looks like nature surrounding you sometimes it definitely doesn't sound like it. Bathhouse, Boating, Kayaking, Campground Host, Fire Rings, Fishing, Grills, Hiking Trail Kiosk, Parking, Picnic Tables, Restrooms, Showers, Potable Water Drinking, Pets Allowed. Gear Review: As a Ranger for The Dyrt I sometimes get the opportunity to test out products and the highlight of my weekend at Cypress Glen Campground was playing around with the E.TUNES. “Where there is Sun, there is endless fun!” Renogy’s E.TUNES is a solar bluetooth speaker designed with portability and listening in mind. You’re able to stream your music seamlessly anywhere via Bluetooth or connect your phone to the E.TUNES by using the provided AUX cord. Weighing in at less than two pounds, this compact, splash proof speaker can be easily carried by the included strap or carried in your backpack. With a dynamic frequency range, an enhanced bass, and 10 hours of playtime, your ears are in for a treat with this powerful sound system. The E.TUNES also comes equipped with a built-in solar panel for charging convenience and a side light with SOS mode in case of emergencies. The E.TUNES also doubles as a 5000mah Li-ion power bank to charge your phone. Layout of all of the options and the features themselves all easy to navigate. The sound quality is great, it amplifies loud, clear, and crisp. Even at the loudest volume, the sound is great. Seems like it’s well construction. Although I thankfully haven't dropped yet to know one way or the other. The battery lasts surprisingly long. We kept it going at medium volume for about 5-6 hours with battery to spare for the next day to play more podcasts. I love that it’s water resistant but haven’t left it out in a rainstorm to truly test it (and hopefully won’t). The flashlight on it is also super bright. For backpacking it’s pretty large and not as mobile friendly as I’d thought. The strap is a cool, although, as you can see in my video one of the snap rivets that doesn't grab right and just comes off with virtually any weight on it. Only seems to seat well on its feet on very flat surfaces. The base speakers are located on the backside where you’d expect to lay it on a table and the grooves are large on that backside allowing dirt or sand in it. If you want to charge other devices (i.e. phone) don’t expect too much. It will drain the battery quickly to fully charge your phone. Overall, I like this speaker because the sound quality is good, and it does what it says so far. I like that unlike some of my other Bluetooth outdoor speakers I don’t need to bring an extra battery pack just to charge it, thus making it perfect for a basecamp or pullup campground. One last thought, it wanted to let you know how to access the volume up/down options on the speaker. They are actually the "Next" and "Previous" buttons. These buttons serve double duty as the volume buttons, you just need to hold them down for another second to switch over to volume and you can then have full control of your speaker while storing your phone away. I give Renogy’s E.TUNES 4.5/5 stars. Large sites, and well-maintained. Perfectly located just off the exit for Brooksville off of I-75, and right off the Withlacoochee Rails to Trail bike/hiking path and near the Croom Mountain Biking Trails. Friendly camp host and many like-minded cycling neighbors make this is a great spot to stop for the night! Watch out for curious rabbits, armadillos and enthusiastic (loud) screech owls if you are in a tent/bikepacking. All of the spaces are nicely spread out and are mostly shaded (needed here in Florida), there is electrical & water hook-ups and many of the sites have a partial view of Silver Lake. Water & electric at these sites are useful if you’re in an RV. However, if you’re in a tent I’d recommend the option of no electricity at Crooked River Campground just a wee bit farther into the recreation area and much nearer the river. While these are large shaded site with water, electric, and your standard picnic table, and a fire ring. The facilities were rustic and clean but by the end of the day they did need cleaning and the paper towels ran out. Would like it if they had reservations for the camp sites so I can use my credit card instead of bringing cash, though I know they will be switching to that later in the year! 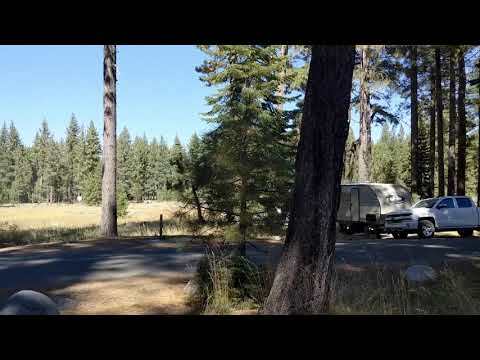 The Verlot campground is in a beautiful location within the Mt. Baker-Snoqualmie National Forest. This small campground showed us that sometimes camping down by the river in a van isn’t really a bad life decision. The campground themselves are 2 small loops that were nicely laid out with a good number of the 26 sites being on the water. Some of the sites are more secluded than other, and a few are setup to be combined with their neighbors to accommodate large groups. Our site (#13) was one of the sites which is more separated from the neighbors on both the left and right by fairly thick underbrush and mostly shaded with the river side being left completely open. We then had a little path right down to the river. Within the site itself you get a nice decent flat area for a tent or 2 and your standard table and fire ring with a grill. There are tons of potable water spigots located throughout the campgrounds and the restroom facilities were simple but clean and fully functional. 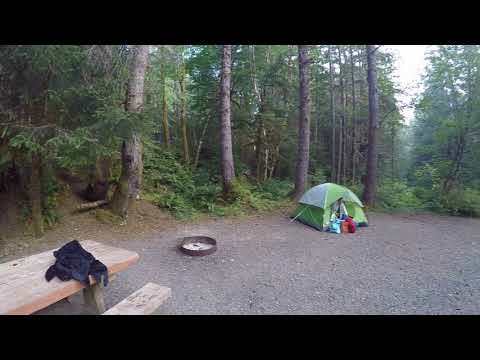 This is a great location for either just relaxing and taking in the quiet sounds of nature or as a jumping off point to explore more of the National Forest and eventually the Northern Cascades National Park. 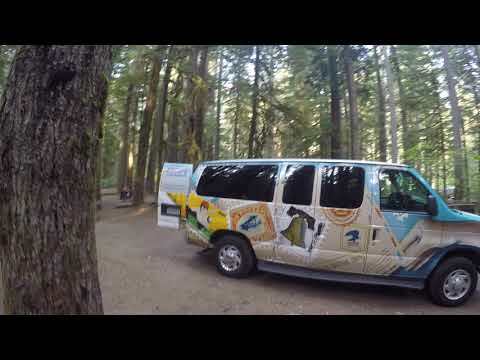 Campsite Review: When exploring the San Juan Islands in North Eastern Washington I suggest you definitely take a moment to visit Deception Pass State Park where camping might seem a little pricey, but your park admission is included in the cost of the campsite. This is a great location to start of your trip if your spending time up in the North Eastern portion of Washington. This campground is composed of several different loops with setups on both sides of the pass for every type of adventurer. There are over 300 different campsites and several that are hike/bike in only, as well as your standard drive up and RV. These sites are spread into different areas of the park, and we stayed in one of the lower loops of the Cranberry Lake campground where many of the sites have open drive ways, but then are really set into the old growth trees. Ours was a drive in which was a little uphill and then set back into the underbrush so you were nicely separated from your surroundings and felt pretty immersed in the forest. You get a decent flat area for your tent(s) with a standard picnic table, and fire ring. We checked in a bit later than expected and were in need of a shower. Thankfully there are pretty decent showers at this campground, though some restrooms were much nicer than others. Make sure to check out a couple before you decide which one to use. We found that the ADA showers were much cleaner and nicer than the regular shower by our site (#172). In order to use the pay showers you have to use a token (2 for a dollar) instead of quarters or dollar bills like most other places. You can get the tokens from the rangers or they have some vending machines on the side of the little camp check in area. There are plenty of excellent hikes you can access throughout the park and watching the fog roll in and out can be pretty awesome. The one thing that you’ll probably read over and over again is about the jets from the nearby base…. Yes, there are jets and yes, they are loud, very loud. Bring ear plugs. Even if you’re a heavy sleeper, the way the noise bounces around through the valley makes them extremely loud. You never know how late they’ll hang around so just be prepared. They stopped fairly early (around 9:30pm) when we visited, but the flyover time seems variable. We used this campground to not only hike around and explore the park, but also as a jumping off point to kayak around the island (where we picked up a hitch hiking baby harbor seal) and to head out on some whale watching trips. This is a really incredible area with lots to explore. How lightweight, and unrestrictive the top felt. Really strong sturdy seams and didn’t mess with my mobility as I was paddling the kayak. A really breathable base layer with the vented mesh underarm sections. This is usually a breaking point in wearing a base layer when doing activity as you can’t cool off the areas you need to while still staying warm. I really liked the length of the top, this really helped to sort of counter the shortness of the pants. 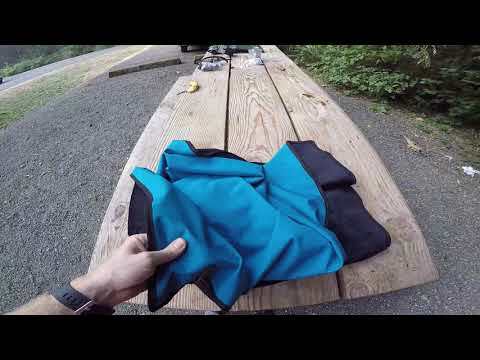 The stretch of the material in both the pants and crew top were great for hiking and kayaking. Designed and Knit in the USA!! Awesome. I give the ColdprufZephyr crew top and pants 4/5 Stars! 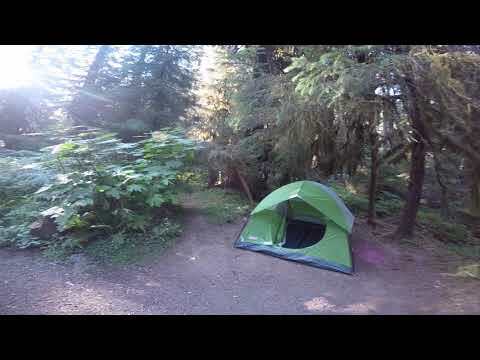 Campsite Review: This campground in the Sol Duc Valley is composed of several different loops and setups for every type of adventurer. In addition to the lodge with a general store and restaurants, there is an RV only parking lot which seemed a little different as it’s just a parking lot with hookups and a table at the end of each space. There was no separation whatsoever between them. However, the loops are more set into the fairytale-like forest and you feel much more like you’re actually in the rain forest. The campsites themselves seemed to all be kind of small, and a little close together but with nice flat areas, tables, fire ring, and lots and lots of underbrush you can’t really see your neighbors. We stayed at site 38 in loop A which had a nice tent spot set out under the trees along with a decent table and fire ring set back from what is basically a parking lot that was open to the road. When getting your site be careful about the exact size allotment if you’re in a larger vehicle, because these sizes didn’t seem correct. This site is listed as being a 35’ back-in, but it really is just a shared parking lot between this and the site next to it (37) across from the central restrooms. While the site might say it’ll fit your vehicle, the roads are narrow and there are a good number of trees and branches around which may impede your maneuvering if you’re in something large. Because our site and the one next to it have “spaces” for 2 vehicles each, we did have a few people whom would pull up park in the “lot” and then explore around the campground and loop at the board for available spaces which was a little annoying, but at least they aren’t walking through our site. The toilet facilities in Loop A were clean, but could have used a good once over. They seemed to have been maintained, just not super regularly and thankfully no guests had come in and destroyed them. There was hand soap but unfortunately the hand dryers were broken (which I normally like because of the reduction of trash, but dislike because of the increased noise they produce). You have some potable water/dish cleaning spigots, but nothing is there to catch the waste. There are also a couple of bear proof trash cans and the camp host sold fire wood (pricey at $8 a bundle). However, you can collect downed wood whenever the host isn’t selling wood. You’re also just down the road from the Sol Duc Hot Springs, which is 3 different pools with the water pumped into them. At $15 a person, this seemed a little pricey, but you do get access to the showers, so if you’re really desperate it might be an option to clean up and then relax after some strenuous hikes. This jacket was very lightweight, but also felt sturdy. Really seemed to be put together well, with strong seams and solid sticking. It was a breathable jacket that still kept me warm. While exploring the wilderness coast of Olympic NP I was glad to have this jacket as I didn’t feel any bite from the cold winds coming in off the Pacific, but also didn’t sweat while hiking around. Excellent pocket placement. Having your standard waist pockets isn’t always enough, and the bicep and breast pockets were perfectly placed and easy to access while on the move. The stretch of the material was great for climbing around and didn’t restrict my movement at all which sometimes happens with having on a jacket. I really liked the design and coloring. I give Beyond Clothing’s A5 Rig Light Jacket 5/5 Stars and wear it literally every day even when not camping! The toilet facilities weren’t the nicest ones I’ve been to and could have used a little TLC. The facilities right by us were dirty and a bit rusty. They also had no soap or hand drying instrument what-so-ever (neither paper towels or hand dryer). Thankfully we had these things ourselves, but usually in NP campgrounds you don’t have to bring them yourself to the restroom. Amenities: not sure if every site had one, but lots of bear boxes (you’re in bear and cougar (mountain lion) territory), your standard picnic tables, fire rings, plus flush toilets, potable water, & dump station for you RVers |Prohibited: pets off-leash, & firewood gathering (The camp host drives around selling wood if you haven’t already gotten some at a store) we came right during a fire ban, but as soon as it was removed they drove around letting everyone know. There then seemed to be a truck driving around with firewood for sale, I wasn’t able to confirm though as we were headed off to Paradise and then the Olympic peninsula. Gear Review: As a Ranger for The Dyrt I sometimes get the opportunity to test out products and the saving grace for this particular camp site was my testing of the Leatherman Signal (Designed for adventure!!). This is a truly fantastic Leatherman and even if you’ve had them for years you should really check out the newer lines of specialized gear. I had an old PST (pocket survival tool) as a boy scout and had upgraded to the original WAVE, but hadn’t checked them out in years as I still have them and thought what could be better than what I already have. I was wrong. This tool and many of the other lines (skateboarding, surfing, skiing, hunting) are also really worth checking out. This is designed specifically with camping in mind. Really impressed with the new ability to change out components from this and other tools are you wear them down. The hammer is great for knocking in tent stakes into some stubborn ground or breaking up that giant block of ice into some manageable pieces. It’s really all the little touches that make this an awesome tool. Like having a sharpener, a built-in fire starter and emergency whistle. These are things that might end up saving your life if you happen to get stranded while out in the woods. 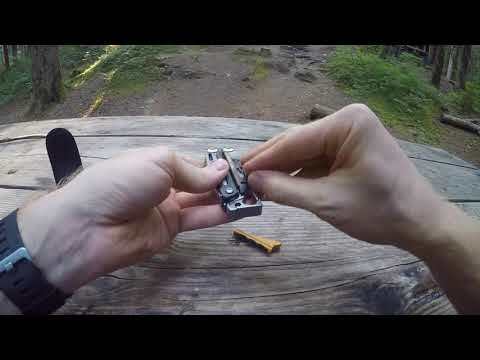 I give the Leatherman Signal 4.5/5 Stars! The Silver Lake Recreation Area offers three different campgrounds to stay at, depending on what you are looking for. The Silver lake is the most RV friendly with huge shady campsites under large oak trees and each has plenty of grassy field area to make up each of the the sites at Silver Lake Campground. From most of these sites you can get some views of the water. Silver Lake campground along with the Cypress Glen campgrounds are the 2 of the 3 in the recreation area to include water and electricity hookups. The sites, while covered and under the oaks are really open and include your typical picnic table, fire ring, etc. with easy access to restrooms and showers located nearby. Due to state budget cutbacks, the main gatehouse to the recreation area is actually closed (so all of the campgrounds are self-check-in and/or honor system, although there are camp hosts whom can check up on you) and the campsites were in need of a little cleaning, but not bad. That could be easily remedied if everyone just picked up a little bit of the trash and took it to the provided trash stations. The biggest drawback about this location versions the other campgrounds in the recreation area is this has the closest proximity to I-75. You’re really close and you can (and will) hear the traffic noise all night long. For tent camping, this/is could be a deal breaker. However, as this location is more geared towards RV with the water, electric hook ups, and dump station. You’ll have to decide which you value more. · These are really pretty developed campsites with electricity, water, picnic table and fire ring with a grate and/or a grill. Stayed over mother's day weekend at Lithia Springs. The sites are nice and spacious, have really excellent tree coverage (this is a MUST during Florida "summers"). Although, $24 to camp seemed a bit much. I felt that the spaces in the back loop were a little more secluded and were really nice because they were closer to the water. They all have fire rings, tables and power. The best thing about the campsites was that the restrooms back here were way nicer and cleaner than the main park bathhouse which was a mess. That was probably because the park itself got incredibly busy (guess the secret of this park is out). Maybe the park itself would be better in the "off" season when it's not so packed. The trails are nice, but there's not a ton to see and they aren't super long. Nice secluded campground where each site is set back and nestled into a saw palm clearing and equipped with a picnic table, fire ring/grill and food cache box (an elevated roofed chicken wire cage). This campground is super easy to get to from the ferry, less than a mile walk (about ½ mile). You are responsible for carrying all of your own gear to the campgrounds so you’re want to pack it all in a backpack, bring your own wagon or hope to try and borrow one of the wagons they have at the ranger station (they do have a lot, but they get taken pretty quickly). Once you’re in the campgrounds there is a nice short trail directly onto the ocean side beach, which is wonderful for catching the sunrise. Another nice feature about this (compared to the other north primitive sites on the island) is that they are the closest and a relatively short walk/hike to the Dungeness Ruins. If you stay for a while or have the time head up to the northern end and visit the Plum Orchard Mansion (14 mile round trip) as most people don't and you'll likely get an almost private tour (we thought we would right up until the very last moment when another small group showed up). If you want to explore more of the island in a short period of time I’d suggest biking. You can bring your own ($10 fee) or rent bikes from the ferry personal ($16 day, $20 overnight). If you are renting, I’d suggest renting them the day before (overnight) so you can then explore a lot more of the island first thing in the morning before the day trippers arrive on the ferry. This campground is the only campground on the island where you’ll have access to potable water, restrooms and cold showers so if you want to stay here definitely make reservations. The 16 smaller & 2 group sites are all located off some main paths situated in little clearings of the saw palmettos giving them a little bit of privacy. The northern half of the loop is more separated than the southern but all the sites are located under the trees so you'll get a decent amount of shade/wind cover no matter where you. You don’t reserve a specific site when you make your reservation but get to pick your site from the remaining open sites after a nice long introduction/video from the camp host once you arrive. So you don’t fully know what you’ll be able to select until you’re there. · These are tent only primitive campsites with the standard uncovered picnic table and fire ring with a grate and/or a grill and your chicken wire cache box to keep they racoons out of your food. · Camp fires are only permitted at Sea Camp & Stafford Beach campgrounds. You must use designated fire rings. You may gather dead and down wood or purchase bundles of firewood on the ferry. · Flush restrooms and potable water. · There are actually some electrical plugs hidden about that I say someone charging there phone in at one point. · No Pets: Only service animals are permitted in campgrounds. The Lower Hillsborough Wilderness Preserve is one of the largest contiguous recreation areas in Hillsborough County. There are lots of different parks and areas all contained within the Preserve with all park sites managed by the Hillsborough County Conservation and Environmental Lands Management Department. You can only camp within 2 of these areas, the Oak Ridge Equestrian Area and at Dead River Park. Other parks and trails are located at the Wilderness Park Off Road Loop Trail System, Flatwoods Park, and the Jefferson Equestrian Area. The Morris Bridge Park, Trout Creek Park, and John B. Sargeant Park, offer day use areas and boat/canoe launch ramps. Adjoining the Wilderness Preserve is the 3,000-acre Hillsborough River State Park, which in itself is an area of beauty and tranquility known as the Seventeen Runs of the Hillsborough River. This park also has wonderful camping. · Campsite available to youth groups by reservation only. Minimum of 6 and maximum of 30 campers allowed. Groups must have their own insurance. · A 0.25-mile hiking trail for use by campers located adjacent to campground. · Bathhouse and picnic facilities provided. The Oak Ridge Equestrian Area has 2 different campgrounds. · Over 16-miles of equestrian/hiking trail for use by campers located throughout the campground. · Sites have picnic tables, fire rings and/or grills and there are ADA portapotty and non-potable water available.